Keep your new device protected anywhere you go, from your desk to the great outdoors. 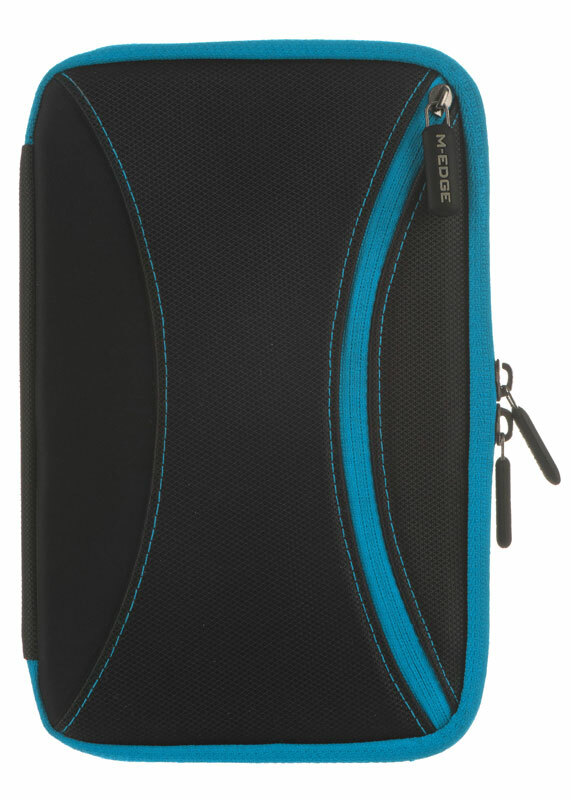 Gear up for life on the go with the Latitude case. I love my lat jacket. When some one bought me a nook he also bought this jacket and I think it's great because you can keep your charging handy as well. So now that I have the nook color I looked every where for this same jacket at the store but no luck. So I'm glad I checked this web site for it and I'm buying another lat jacket Thank you. I have been looking for a lightweight case with a zipper on three sides to protect my nook in my purse and this one is perfect!! I don't know why there aren't more of this design out there! The nook fits in the holder very securely. I did not want to have to take the nook out of the case to use it! The double zipper makes charging easy. The pocket is extremely small but works well for my stylus and cleaning cloth. The charger is way too bulky to carry around in a case anyway. Within the last 6 months I've now purchased TWO of this same type of cover. The first was for my Kindle, I totally loved it. Therefore when I exchanged my Kindle for a Nook Color there was no choice for me except to buy another M-Edge cover. I'm just as pleased with this cover. It's extremely versitle and I think you'll like this particular cover for your e-reader. I had an m-Edge cover for my Nook (b&w) reader and recently bought one for my wife's new Nook Tablet. The zipper helps protect the Nook and the fold-back cover is perfect for reading. I recommend these covers. 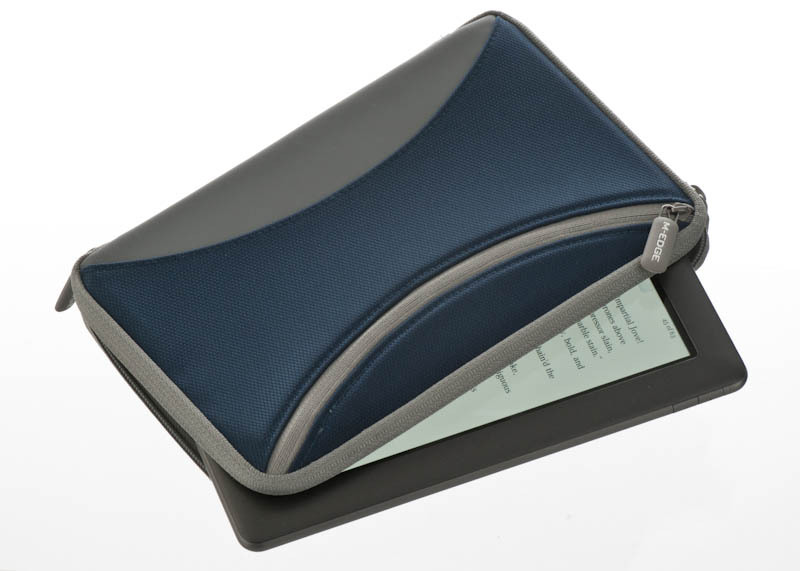 This is absolutely the best case I've seen for the Nook Color/Nook Tablet. I wanted something that zips shut, and isn't bulky, but provides the necessary protection for my tablet. This meets/exceeds all the criteria. The molded clamp system securely holds the device in place. Polar fleece lining is a nice touch as well. Highly recommended!! Purchased this jacket several weeks ago for my new nook tablet. Read lots of reviews for different products and settled on M-Edge. I couldn't be happier. Use it everyday, easy to use, keeps my nook clean and protected. Zipper works great, absolutely nothing I would change. Great Product! Barnesandnoble should learn from m-edge that how these products are designated, and made.It's perfect case.It's also styllish and sturdy case.Color is perfect.Thank you for this kind of products. I received it in 4 days as an international buyer.Lightning speed!! Many thanks again!!!. This was the only light weight, zippered cover I could find. My daughter had already gotten one in blue, but I wanted purple. Ordered online, it arrived quickly. Both the color and the fit on my Nook color are perfect! Previously I purchased 6 m-edge cases for 1st gen Kindles and they have held up well. I like the material for Nook case even better; it should be easier to keep clean. My only complete is that the space for the ridiculously larger charger is really tight and I don't know if the zipper is going to last as long as the zippers on the Kindle covers. Give the power cord space just a little bit more room and it would be perfect. I love the jacket. 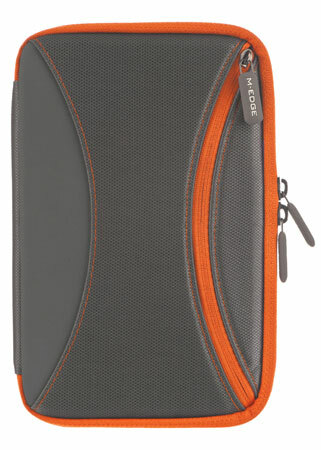 It is well padded with a zipper to keep a stand, earbuds,extra SD cards etc. I feel that my nook will be safe for travel in this case. I got the gray and orange cover that was a limited edition case. I was so impressed with the original Latitude Jacket that I bought for my first Nook that when I got a Nook Color I didn't even consider any other type of cover. It had to be a Latitude Jacket. The NC snaps in securely, and when the case is zipped closed, the NC is completely protected. The nylon on the Nook Color Latitude Jacket seems to be even heavier than on the original Latitude Jacket, and the zipper tabs have a rubberized plastic cover. I really like the gray color with the orange accents. 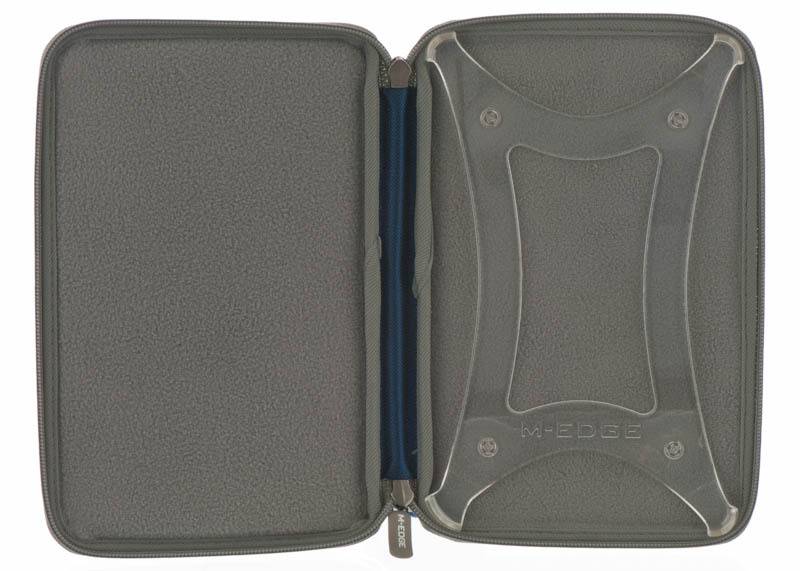 It's a very sharp-looking case, and it's very durable. Great job, M-Edge! My nook is held secure, the dang thing even zippers open. I have been waiting almost three months and my wait is finally over! Thanks m-edge for making a cool product! 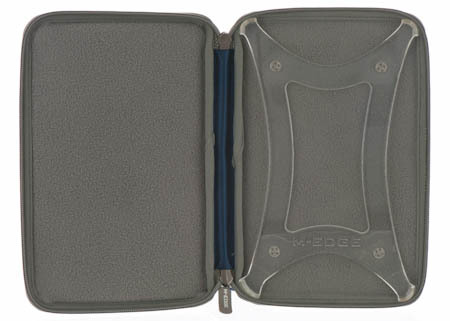 I originally got a M-Edge case for my Astak 5" Pocket Pro EZ Reader. I liked it enough to get another when I got my Sony PRS-600. They were a decent case with all fabric construction. Very nice design. When I got my Nook color I decided that I liked these cases enough to get anther M-edge for it. I purchased the Lattitude cover for my Nook Color and found M-Edge had changed from the all fabric design to a fabric with a slick rubberized half-moon on the front pocket. To me this was a very bad change. It is slick and feels very odd. Great easy to use clip for the Nook. Rubberized zippers are an interesting touch but ... it is just a design element, not a practical or functionality change. The front pocket as other reviewers note is small. It will hold the cleaning cloth and alternate memory cards but not the power brick but then it was not meant to. The fleece inside is nice for covering the screen and if the case is folded back it makes for an easy grip to hold your Nook. The slick rubberized half-moon on the front pocket is the main drawback for me. if your fingers get wet they slide on this. It retains the markings/scratches of something hard inside (memory card case) rubbing against what you normally carry the case in, (backpack, messenger bag). This ends up detracting from the look of the case. 5 stars for the design and utility. 1 entire star lost for the rubberized half-moon. Someone should have done more research before implementing this. 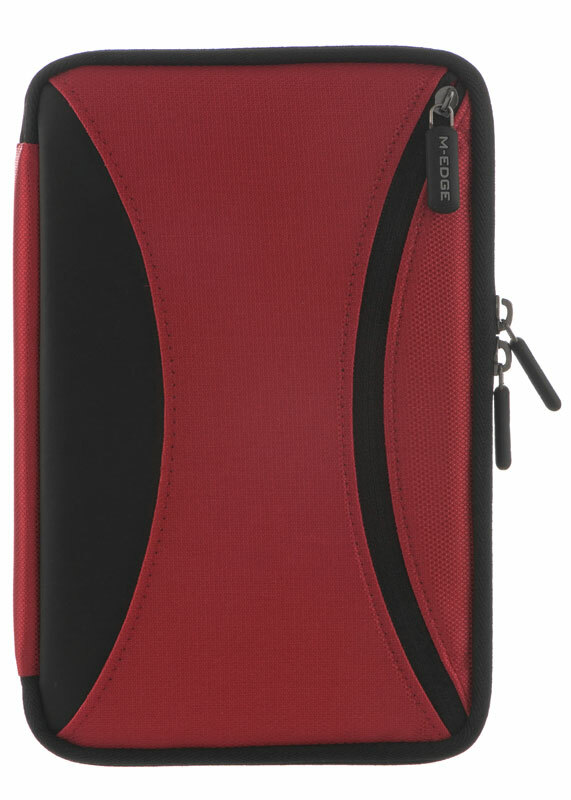 When I first bough my Nook E-Ink reader, I purchased a red fabric M-Edge cover for it with a zipper pocket and elastic "holder straps" to keep the nook in place. Later, I traded for a nook Tablet, and the cover still fit fine, but was getting a bit grunjy and the elastic was not holding tightly, but I still like the cover because of the zipper pocket (which B/N did not supply.) I finally bit the big one, and decided after three years it was time for a new cover (I didn't think washing the old one would work well.) I found a beautiful deep plue cover that holds my Nook Tablet securely and still has the zipper pouch I love (though it doesn't have the "Papers Pocket" on the back cover. The material the cover is made of is a beautiful shiney blue that looks like I can simply sponge it off if it gets dirty. I love the plastic Nook Holder device because it leaves the volume, power, and phone jack area free and clear (which the elastic did not) and looks like it will work for years! Thank you for the great improvement! Well worth the $20 I paid at Staples! I have a latitude case for my first nook and was delighted when you finally got the purple latitude case in stock for my new Nook Tablet. I had tried to order one earlier this year but you didn't have a color I liked. It provides great protection for my Tablet and after reading on it without a case, I have discovered that it is much more comfortable to read with the case on. It is easier to hold and props up better. I also love the protection they provide by zipping shut when not in use! 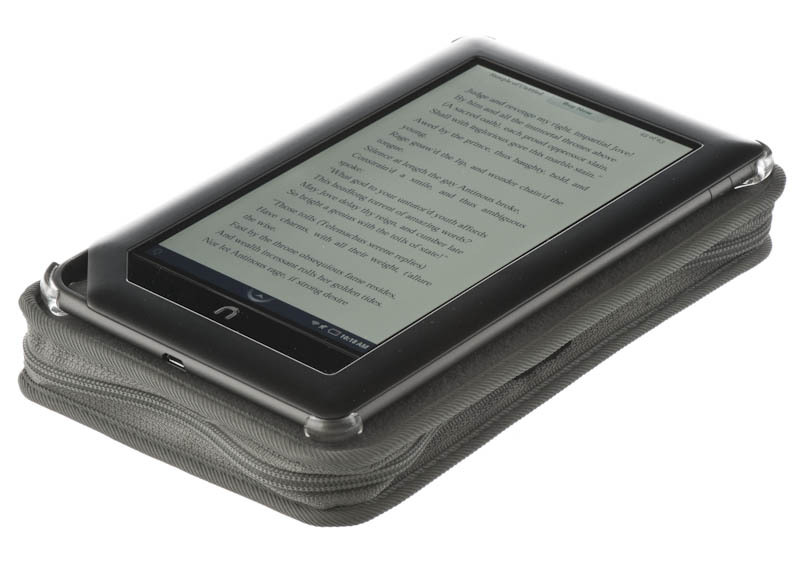 I don't ever want a nook without a latitude case. My husband has had cases from Barnes and Noble that look good but are not as easy to read with and they do not zip shut. I work in a dirty, and potentially dangerous (for a Nook) environment. The Latitude Case is what works to keep my nook clean and safe. Great product! 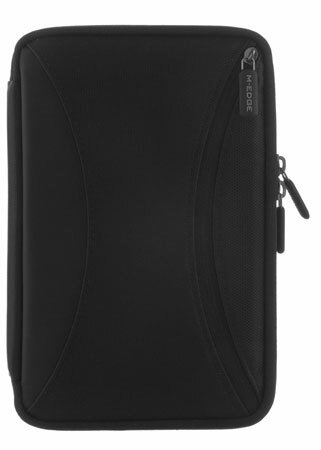 The case is just what I was looking for to carry my nook tablet. It holds the nook securely and the fact that it zips all around is a big plus. The zippered pouch on the outside is not big spacious enough to carry much of anything except a cleaning cloth. There is enough room inside the case to keep a stylus. The price is good too. This is not my 1st Latitude Jacket for my Nook Tablet - Just my favorite color! I love the products that I have purchased for my Nook and Nook Tablet from M-Edge. The quality is what drew me in and keeps me coming back. I have found the product support, for want of a better term, to be brilliant. I was able to chat on-line with a representative, who listened and communicated back quickly and very responsively. This issue that I had was resolved in such a way, that I will be a loyal customer FOREVER, and will continue, as I have been doing for years, to highly recommend your products to others. Thank you for the opportunity to speak up. This is the best cover available on the market for the Nook color or tablet. The nook snaps securely into the cover so there's no danger of it falling out when you open the cover. This cover protects the nook from damage if you should drop it (I know this from experience! ), and the zipper closure keeps dust & dirt from getting in. The only thing that would make this cover better would be a built-in [adjustable] stand. However, I've been able to use the cover folded back to sometimes prop up my nook while reading anyway. I purchased this product for my new Nook Tablet because I had already purchased the same case for my Kindle Keyboard because I love it!! The zipper feature - you can zip it closed and you can zip it open so it doesn't get in your way while you are reading. I really like the fact that it zips closed so crumbs and whatnot found in the bottom of my purse don't get on/into my Nook or Kindle. The case has also protected both of my e-readers very well from scrapes and damage on the few occasions I have dropped them. It is made of durable, nylon material so it cleans easily, my Nook and Kindle both fit perfectly in their own Latitude modes jackets. The Latitude Jackets are available in an array of colors. It is NOT bulky and always stays closed. Other reviewers have mentioned that they don't like the fact that they cannot store their chargers in the jacket, but if that were the case then this Latitude Jacket would become too bulky. I recommend this jacket to anyone who owns an e-reader for which M-Edge has a corresponding Latitude Jacket. As long as you purchase the Latitude Jacket that corresponds to your e-reader, you won't have to worry about it falling out because they fit very securely in the jacket. I will never consider another type of cover for any of my current and/or future e-readers. I purchased this product for my new Nook Tablet because I had already purchased the same case for my Kindle Keyboard because I love it!! The zipper feature - you can zip it closed and you can zip it open so it doesn't get in your way while you are reading. I really like the fact that it zips closed so crumbs and whatnot found in the bottom of my purse don't get on my Nook or Kindle. The case has also protected both of my e-readers from scrapes and damage very well on the few occasions I have dropped them. Went looking for a case at Tuesday Morning but only found stuff for a Kindle which didn't work but liked the style so to save myself time and gas, found this gem of a case at Office Depot and seems to be holding up well for myself and my 2 year-old son who holds it in his lap using the Read to Me function. Wish the Nook version was a mesh pocket but I don't anticipate I'll be carrying the charger stuff with me but if that changes - will update for sure! I had the latitude jacket for my first generation nook for two years and loved it. I just upgraded to a nook tablet and wanted a new case. After looking at a lot of cases, I went back to the latitude jacket. It just arrived and my nook tablet is safe in the latitude jacket. 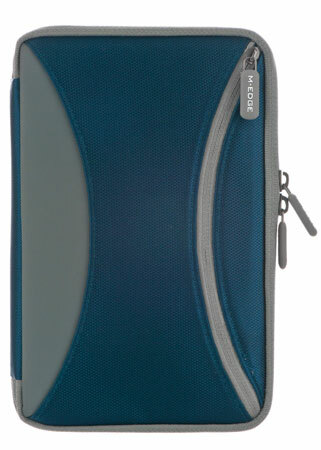 I used the zip pocket to put my library card in, loose change (in case I forget my water at the gym), gum, sometimes my ID, etc. I don't use it for the cords, but I have found many other uses for it. I got the Purple/grey and it's very pretty. I have been using a similar cover for the first Nook reader. with the light which slips in. and love it. When I bought the Nook tablet I immediately went to M-Edge for a cover. Sorry B&N but your covers don't do it for me. I like having the full zipper for security and cleanliness. The front pocket on both of my covers is basically useless - too flat. I am not comfortable storing the chargers there for fear they might damage the screen. My main complaint, however, is that this cover does not come in green! I like most of the aspects of the cover. It is great that I do not have to remove it in order to charge and reading with the cover in place is very comfortable. The only reason that I did not give it five stars is because the outside pocket is useless. Once you put the Nook in place you can not even put a cord in the pocket. The pocket needs a gusset in order to be useful. Even with the pocket problem I would buy this cover again. It is lighter in weight than others , fully protects my Nook Color. Like how the zipper fully covers it and protects it. folded back for great reading surface. I would highly recomend this as the best cover out there. A new ereader means a new Latitude cover. I've switched from Sony to NOOK, and the new cover is not only spiffy in aqua, but it was on sale. I still have my light from the old covers, so I'm good to go! The Lattitude Jacket works out perfect. The jacket protects the Nook Color perfectly and easily folds over in order to read the Nook Color conviently. I really like the new case for my Nook. I had a stretchy nylon one (also m edge) that I used for over a year but then the zipper wore out and I had to replace it. The new one I just got is very nice. It is strong canvas and the zipper works much more smoothly than my last one. I find the zipper pocket great to hold my earbuds. The fit for my Color Nook is perfect. They were out of stock and found me one of the black and blue and no longer carried at Best Buy- service was great- still waiting for my stylus. I had the Lattitude for my original Nook and loved it so much. I was using it for my Nook color but it wasn't holding it in very well since the NC is slightly larger than the Nook. Glad they made one for the Nook Color. So far the plastic snaps are working well. My only complaint would be the missing pocket on the back. I would use that to slide my hand in to hold my Nook while reading. 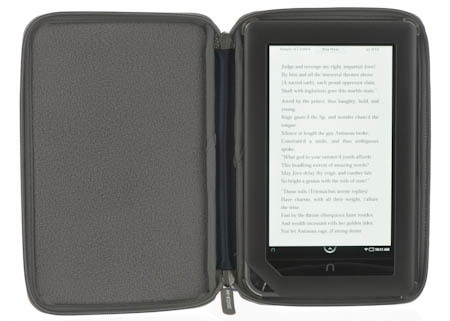 Would like to see that added to the Nook Color Lattitude. I needed more padding for reading to the grandkids, so this is perfect. Will put ear buds im pocket. Thanks! Love the quality of the m edge products. But the design of this latitude is different than the one for the original nook. 1. it has no pocket for the eluminator light, but it seems to slide in ok on top and 2. not sure I like the plastic snap in design. We'll see how it survives, hopefully it is unbreakable plastic. I love the material the new jackets are made of but there's not enough room for the ginormous AC adapter that comes with the Nook tablet. One must cajole the zipper to close. I haven't had the jacket long and I've already broken the zipper pull. Yea I agree with the others it is da prefect accessorie for my nook color had it for the first nook now after all this time I can't believed I waited to get this again . You should not consider eny other this is the one and only item u should add to the nook color it's the best by far ! Love the m-edge case. It holds the Nook Color securely without adding alot of bulk. The only thing I would change is to add some sort of handle or strap for easier carrying.